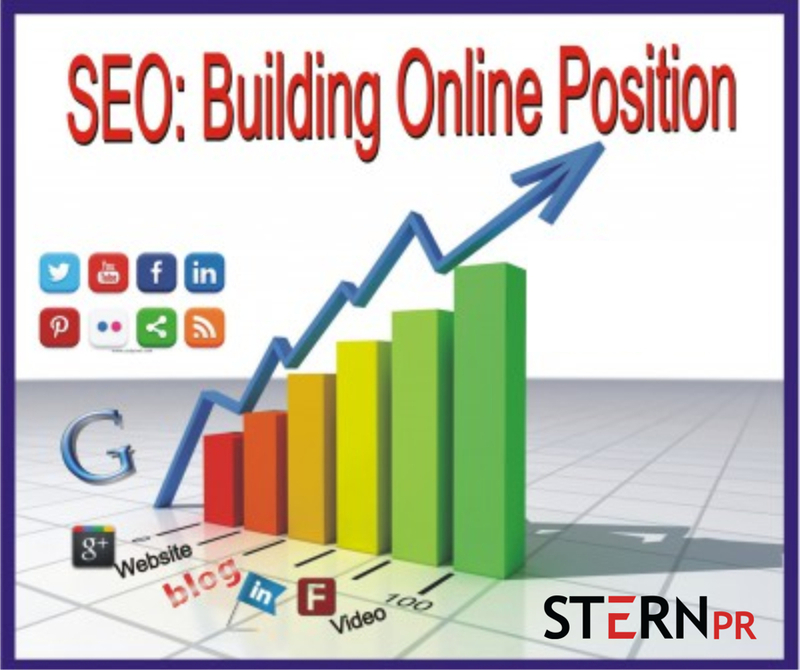 Affordable Omaha SEO Company | Stern PR™ Unveils Monthly Plans! Great price point for the niche. Affordable Omaha SEO company services by Stern PR™. We are proud to announce the unveiling of our new monthly Search engine marketing plans for Bellevue, Papillion, Waterloo, Valley and Gretna, Nebraska small business and organizations. We offer paid and Organic search engine marketing, the latter, we intensely focus on. “Google hints at it in Webmaster tools. Information-rich quality content, rather than mere paid ad space, tends to help raise Page rank in natural search. We offer newsworthy industry article writing mixing in public relations, marketing and journalism, few do,” said Stern PR Omaha’s Susan Stern. Based on the price point your organization sets, our Omaha marketing firm handles all your monthly social media content, online website article writing, SEO, advertising and public relations for your organization. The objective of this internet marketing Omaha plan is two-fold: interaction with clients and would-be customers, plus SEO. Let’s put it this way. Phone book advertising is becoming obsolete. We recommend you shift most of those dollars to internet marketing, to use your small business dollars wisely. What makes our monthly search engine optimizing work we do is that we focus on creating, higher quality content, few can do. We help people find your business under the search times they look up most. We use Google-approved, white hat techniques for affordable Omaha search engine marketing company services. The term SEO is an abbreviation for SEARCH ENGINE OPTIMIZATION. Search engine optimization [SEO] is the process of improving the quantity and quality of Web site traffic from search engines via “natural” (“organic” or “algorithmic”) search results. In digital marketing parlance, the product/service class for SEO + the locality [Omaha], + company [generic for entity] are words internet marketers widely use as keywords, in titles and meta descriptions on our Web pages hoping to gain page rank traction in search results. Ranking high is critical. It’s estimated that 70-90% of people search online before buying a product or service. Where you organization sits on the search engines may make or break a business. We know that the success of your business depends on having a high Google rank. Earning a top position in organic listings does not happen overnight. You need to invest in a monthly affordable Omaha SEO company plan for long-term success. Even if you reach the highest points on the search engines, staying high demands regular, fresh content updates by a professional Omaha SEO strategist. Stern PR™ is the one to call. One of the best Omaha copywriters for both aesthetics and search engine marketing in Nebraska. 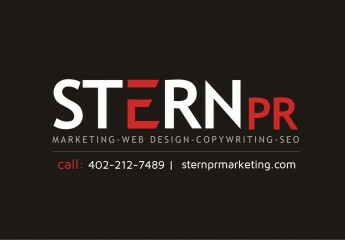 Stern PR™ is an affordable Omaha SEO company. We stand far apart from others because we offer professional copywriting services for both the eyes and ears and search engine marketing Omaha. We are a small full-service Nebraska marketing & public relations firm. Stern PR™ is a premier provider of Omaha website design, video production, graphic design and Omaha marketing mix and Public Relations consulting. 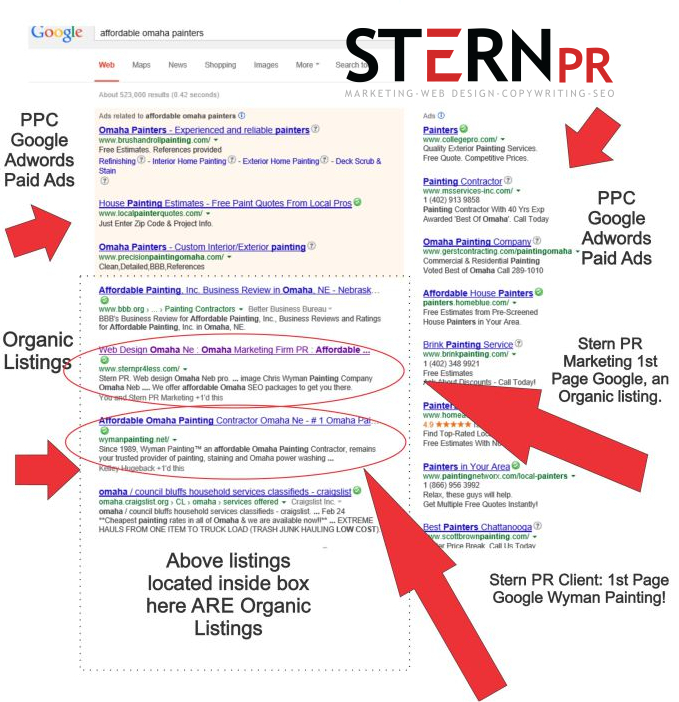 We here at Stern PR™ Omaha, offer organic SEO and PPC (pay-per-click like Google’s AdWords). We recommend organic search engine optimization for all clients, but especially those on a limited budget. See below graph to explain organic SEO. Organic SEO refers to the listings located in the main area, the center of your screen of Google’s search results. These listings cannot be paid for, but are targeted through content created by your affordable Omaha SEO strategist and external factors. Stern PR Marketing™ is a highly effective and affordable Omaha SEO expert that offers organic and paid search engine optimization [SEO] services to any organization that needs it. We put start ups and established business on the map via outstanding Web Design Omaha, Marketing, Advertising & Public Relations. Our motto: if you succeed, we succeed. We help business grow! Article originally published February 14, 2014.